(W) Steven Grant (A) Mateus Santolouco (CA) Rafael Albuquerque. NOW A MAJOR MOTION PICTURE STARRING DENZEL WASHINGTON AND MARK WAHLBERG! Trench is a deep-cover DEA agent. Steadman is an undercover Naval Intelligence officer. Both think the other is a simple gun-for- hire, the perfect accomplice to help steal a bank vault full of mob money for the good guys. And neither realizes that their caper is a gigantic double-cross from the mob, who's just tricked both men into stealing $50 million from the CIA! Now Trench and Steadman race headlong across the Southwest, guns blazing, desperately outrunning Feds and mobsters alike while scrambling madly to find some way of clearing both their names before they're carved on tombstones! Written by comics legend Steven Grant (Marvel's PUNISHER: CIRCLE OF BLOOD, AVENGERS, INCREDIBLE HULK) and drawn by rising star Mateus Santolouco (DC's DIAL H, AMERICAN VAMPIRE), 2 GUNS is a lightning-paced, plot-rich crime thriller! Collecting the classic series for the first time in a full-size edition, featuring an all new cover by Rafael Albuquerque (AMERICAN VAMPIRE) and exclusive bonus content from writer Steven Grant! 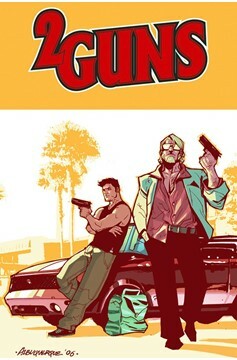 Collects Two Guns issues #1-5..